Is Osama bin Laden Dying ... Again? Which is closer to dying: Osama bin Laden or the CIA's effort to catch him? Nothing has characterized the fruitlessness of the hunt for the al-Qaeda leader so much as the recurrent  and mostly inaccurate  reports that he is seriously ailing, or even at death's door. In 2002, Pakistani President Pervez Musharraf said bin Laden had kidney disease, and that he had required a dialysis machine when he lived in Afghanistan. That same year, the FBI's top counterterrorism official, Dale Watson, said, "I personally think he is probably not with us anymore." 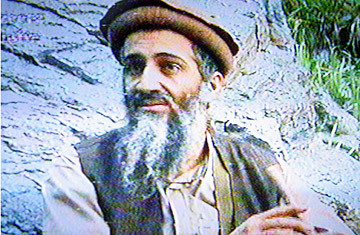 Since then, of course, bin Laden has appeared on multiple videos looking healthier than ever. Now the CIA has produced a report saying that bin Laden has long-term kidney disease and may have only months to live, two U.S. officials familiar with the report told TIME. The agency ostensibly managed to get the names of some of the medications bin Laden is taking. One U.S. official familiar with the report, which came out between six and nine months ago, says it concluded, "Based on his current pharmaceutical intake, [we] would expect that he has no more than six to 18 months to live and impending kidney failure." That prognosis, along with some on-the-ground intelligence and a well-aimed Hellfire missile, will get you a dead terrorist leader. Close watchers of the al-Qaeda terror network find such reports inherently unreliable. "It's trying to make a diagnosis from thousands of miles away with only fragments of the medical chart," says Paul Pillar, former top analyst and deputy director of the CIA's counterterrorism center, who now teaches at Georgetown University. Says Frances Fragos Townsend, who stepped down last November as chief of President George W. Bush's Homeland Security Council, "I've read all the same conflicting reports [on bin Laden's health] that people have talked to you about. I never found one set of reporting more persuasive than another." The CIA, for its part, is disavowing the claims attributed to the report. "I have found no one here familiar with this alleged report or the analytic line it supposedly conveys," says Paul Gimigliano, a CIA spokesman. "The fact that anonymous sources attribute views to the CIA is not, by itself, reason to believe the agency actually holds those views," he says. If bin Laden really is dying, the news would doubtless be greeted with some ambivalence. On the one hand, his demise is what the U.S. government has been fervently trying to hasten  since before 9/11. But death by kidney disease is not exactly what it had in mind. "Wouldn't that be a tragic situation if, with all this effort, bin Laden died without it happening at the hands of coalition forces?" says one current senior counterterrorism official. Given the reliability of past long-distance diagnoses, however, and the continuing threat al-Qaeda poses around the world, that may be the least of America's worries. See "Remembering 9/11: The Evolution of Ground Zero."